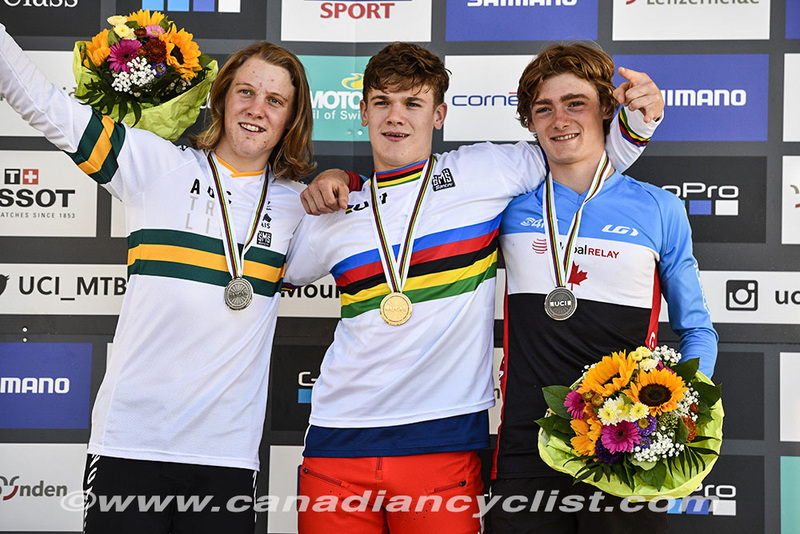 Canada won its second medal of the 2018 Mountain Bike World Championships on Sunday in Lenzerheide, Switzerland, when Elliot Jamieson took the bronze medal in the Junior men's Downhill. 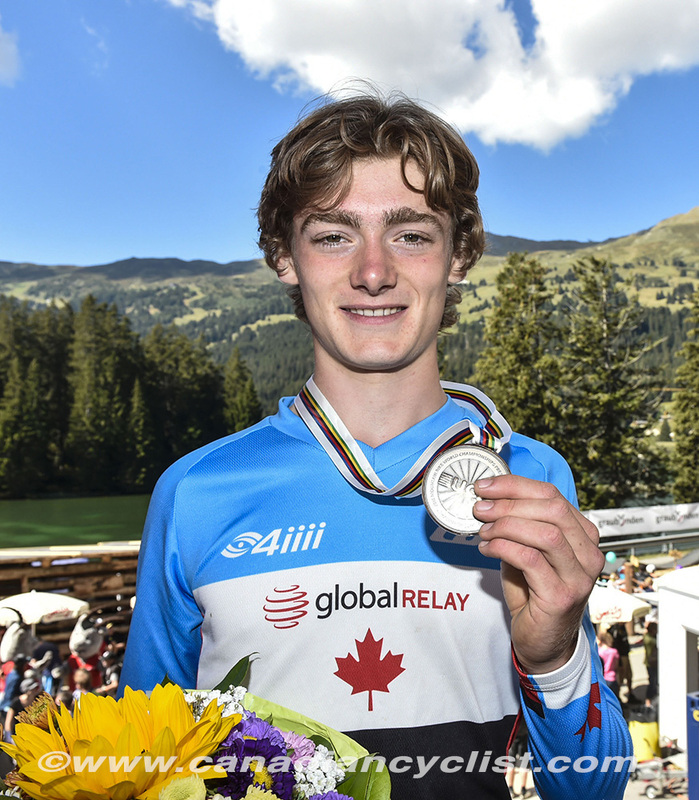 In the Elite events, Finn Iles finished 14th, Mark Wallace 18th and Magnus Manson 19th for the men, while Miranda Miller was 18th in the women. "I can't really believe it," admitted Jamieson. "This is my third Downhill race of the year, so I didn't have any expectations; I just wanted to have fun and ride well. I was shaking when the top ten were dropping in and I was still on the Hot Seat. I'm so stoked, I can't believe I am on the podium." Over 20,000 fans came out to watch Rachel Atherton of Great Britain win her fifth title and Loic Bruni of France repeat as the men's champion, for his third title. Total attendance over the five days of the Championships reached 65,000 - a record for Mountain Bike. 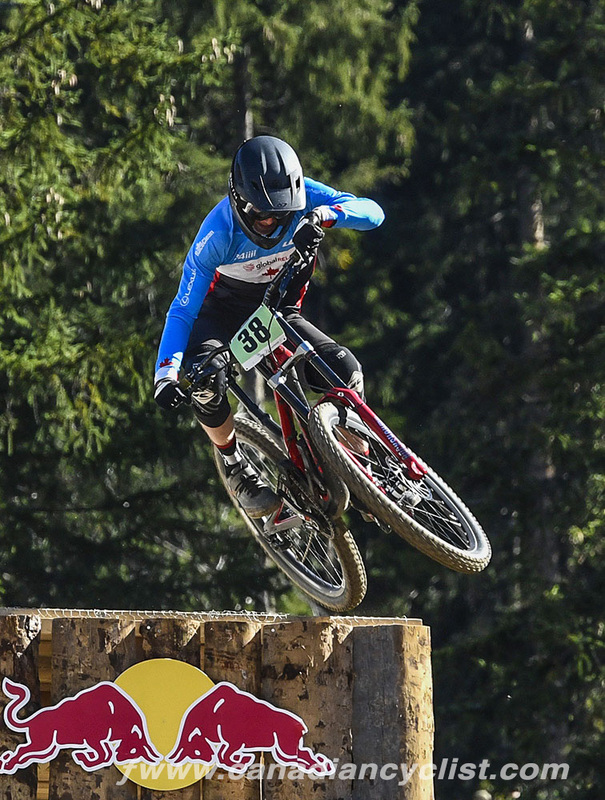 The Elite women's competition was expected to be a battle between British team mates Atherton and Tahnee Seagrave, who battled all season on the World Cup circuit and finished 1-2 in qualifying. Morgane Charre of France set the first sub-3:40 time, which stood until Swiss rider Emilie Siegenthaler knocked three seconds off. Two French riders - Marine Cabirou and Myriam Nicole - took the lead in quick succession, with Nicole taking the lead time down to 3:26. Seagrave knocked another seven-tenths off, and it was down to Atherton, who was clearly riding at a different level. She was three seconds ahead at the first split, six second up at the second, and a staggering 9.983 seconds by the finish. "It hasn't really sunk in yet," said Atherton. "I knew it was going to be a hard race and that I had to be fast. All the way down I thought I was going to crash. Coming into the finish, I could hear the announcer saying I was the 2018 world champion, and I just had to push right to the end. It's hard, because we train earlier in the day when the light is different, so it was hard to see the lines during the race." The lead time for the men's field went down slowly until three-time world champion Greg Minnaar of South Africa became the first to go under three minutes. Minnaar started early, since he missed much of the season to injury, but once he was in the Hot Seat, he stayed there through 27 riders, until Belgium's Martin Maes displaced him by 2.4 seconds. Maes was beginning to look untouchable, as rider after rider failed to match his time. It wasn't until defending champion Bruni came down with five riders to go, that Maes was bumped from the lead; and only by a slim 0.213 seconds. The top two spots on the podium were set, with Danny Hart (Great Britain) taking the bronze. "I had a really good weekend and everything clicked," said Bruni. "I didn't do any mistakes today and the times were super close, so I guess that is what made the difference. It was dusty and slippery, but still wet in the woods, so it was hard to know where to push, because there were a lot of places you could crash. I'm so happy because it's been a year with a lot of bad results and a few good ones. Couldn't finish the season in a better way." Other Canadian results in the Elite men included Henry Fitzgerald in 45th, Forrest Riesco in 49th and Luke Stevens in 70th. In the Junior men's category, other Canadian results were Lukas Cruz in 14th, Ben Wallace in 15th, Kendall McLean in 24th, Justin Clements in 27th, Ian Milley in 40th and Keegan Fry in 47th. In the Junior categories, Valentia Holl of Austria completed a perfect season with her win in the women's race, after winning every World Cup during the season. The men's title went to Great Britain's Kade Edwards.